Those criticising Scotland manager Alex McLeish should direct their anger at those who employed him, says former national team striker Steven Thompson. 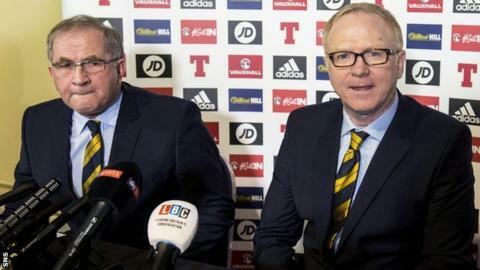 The Scottish FA said they had no immediate plans to discuss McLeish's future after reports on Thursday said he would be sacked within 24 hours. McLeish has been under pressure since last week's abject opening Euro 2020 qualification defeat in Kazakhstan. "The bigger problem is who employed him," Thompson told BBC Radio Scotland. "Where is their accountability? They've no short-term contracts where we can look at them and bin them if they've not done well enough. "I want Alex to stay but if they sack him, they better have the next manager lined up and it better be somebody impressive." The search for a manager to replace Gordon Strachan in late 2017 was lead by Scottish FA president Alan McRae and vice-president Rod Petrie. After a failed pursuit of Northern Ireland's Michael O'Neill, McLeish was appointed for a second spell in charge. But the 2-0 win over San Marino on Sunday was just a fifth in 12 matches and Scotland's fans booed when an image of the manager appeared on the big screen. Despite being under scrutiny from early in his reign, McLeish guided Scotland to a Nations League play-off place by finishing ahead of Israel and Albania. "For the final straw to be the first game of a campaign sounds really strange," said Thompson, who played under McLeish at Rangers. "I know everyone is on an anti-Alex campaign and he wasn't my first choice, or even my second or third, but it's not his fault he was asked to come in and help. "People were waiting for a slip up and Kazakhstan was a cataclysmic one. But he's put us into the Nations League play-offs and I believe we will qualify through them." The mood music around McLeish's future appears to be that of change - the numbers on the Scottish FA board who feel that way have been steadily growing. A conversation between manager and chief executive took place on Wednesday night and, although no decision was made about McLeish's future, it looks like one will be made sooner rather than later. A board gathering would have to take place for a sacking to be sanctioned and, as it stands, there's nothing in the diary. Movement next week though, is likely. The negative vibe is not going to go away and it's looking ominous. The Scottish FA's biggest problem was there was no plan B. They let Gordon Strachan go then put all their eggs in one basket with Michael O'Neill but were left with their trousers down. They had to bring in Alex, who was pretty much the only candidate, because who else had the experience and the calibre to take over? They talk about developing grassroots football, but the Scottish FA should be doing exactly the same for coaches and managers. Look at England, they've taken Gareth Southgate from the under-21s and given him the full job.